What Kind of Venomous Snakes are in Collin County? Help! I have a Snake in My Yard--or my House! Who Do I Call? Don't panic! Help is sometimes only minutes away. Visit the Facebook Page "What Kind of Snake is This? ", post your general location and that you need assistance relocating a snake, and someone will most likely respond within the hour to assist you--for free. Why? Because the members of the group understand the value that snakes contribute to our environment and will gladly relocate a snake to save its life. 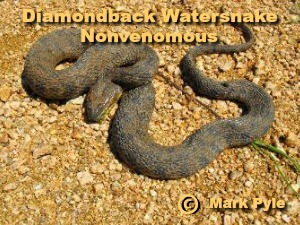 Before relocating, however, you should be aware that some nonvenomous snakes will actually dine on the venomous snakes. Also, if you have a snake in your garage, the snake probably followed a food source--rats. Get rid of the rats, and the snake won't have a reason to be in your garage. If you scroll down, you'll find that we've placed side-by-side photos of the snakes that are similar in appearance. (Turn your phone sideways to view as intended.) These compare only the venomous snakes of Collin County to the nonvenomous snakes of Collin County. 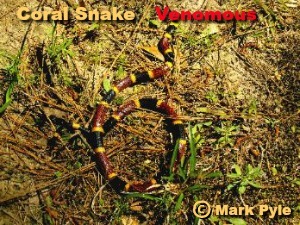 These photos were contributed by Snake Expert Mark Pyle, owner of the Texas Snake ID website. Mark's website should be your first stop if you are heading outside of Collin County or if you'd like to learn more details about the snakes in Collin County. Don't worry, most people don't get the terminology correct. As a rule of thumb, if it is a snake, it is "venomous"; if you eat something, it is "poisonous." What Kind of Venomous Snakes Live in Collin County? 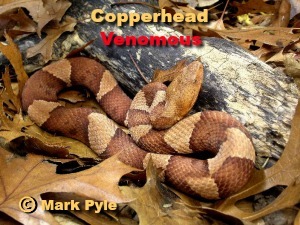 There are four groups of dangerously venomous snakes in North America, and Collin County has three: copperhead, cottonmouth, and maybe the coral snake. It's also a possibility that the Pigmy Rattlesnake is in Collin County, which would mean we actually have all four groups here. Only one Pigmy has been found in Collin County and that was in 1999. So what are the chances you'll step out onto the grass, step on a snake and get bitten? That depends largely upon the location of your home. 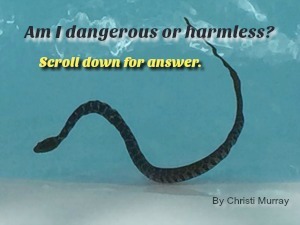 If you back up to a river or creek, or one is within a mile of your home, the likelihood of seeing a snake or coming upon one is greater than if you live in the middle of your subdivision. That doesn't mean you will not see a snake in your yard; just that it is less likely. Snakes, like all wild animals, prefer camouflage and water. But take heart, because not all snakes in Collin County are venomous. The most common snake you'll find in our suburbs is the Texas Rat Snake, which is nonvenomous. Having stated this, this author has lived in Collin County for over five years and has not yet seen a venomous snake. I also avoid tall grass, creeks, and flowerbeds covered in jasmine. 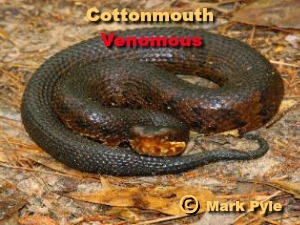 ☺ I've also heard from homeowners who do not back up to a creek, but are within a mile of a creek, that they have found both cottonmouths and copperheads in their yard. Venomous Snake or a Harmless Snake? All snakes should be treated with respect and left alone. However, we understand there may be times when a snake would cause concern and you may wish to have it relocated. (See above for information on free, prompt relocation.) Did you know that by getting close enough to kill a venomous snake puts yourself in harms way? Bite reflexes remain long after death. Just spray it with a water hose if you want it to go away and not come back. Do not EVER pick up a snake if you are uncertain of its identity. Most snake bites occur when a human picks up the snake. Do not rely on this guide if you are unfamiliar with snakes as many snakes appear similar and snake color varies by age and location. 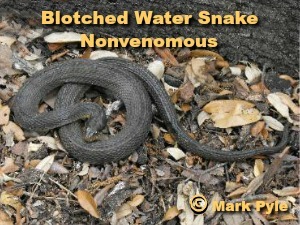 Click on any of the images below and you will be directed to Mark Pyle's wonderful snake ID site, Texas Snake ID. There you will learn more about the behaviors, habitat and snakes living in the suburbs and in the wooded areas of Collin County. What Do I Do if My Child, Dog or I've been Bitten by a Snake? Stop reading this website and call 911 (for humans) or your vet (for your pet). The operator will instruct you what to do. Do not capture the snake and try to take the snake with you. A photo will do if you can't identify it with one hundred percent accuracy. 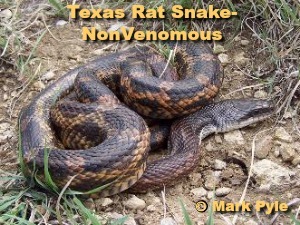 If this is not an emergency and you are researching this topic, visit this Texas Parks and Wildlife page for information on the snakes in Collin County, their venom, and what to expect. Should I Kill Every Snake I See? Snake experts will give you a resounding, "no!" The reason? There are nonvenomous snakes that eat the venomous snakes that scare you. Snakes also eat rodents, so by killing the nonvenomous snake, you're killing God's form of pest control. Additionally, most people are bitten by a snake when handling it--or killing it. And were you aware that a snake can bite long after it is dead? This is why ranchers have been known to bury severed snake heads. But what if your dog, or another animal, digs it back up? The safest thing to do is to post on the Facebook Page "What Kind of Snake is This?" that you'd like a snake relocated. Let the expert snake handlers relocate the snake for you. Facebook Page "What Kind of Snake is This?" At last count, there were near 30,000 members of the active Facebook page. It's the page to join if you are new to Collin County, Texas, or would like to get over your fear of snakes. These members are scattered throughout the state and also offer their services at no cost to assist in the relocation of snakes. 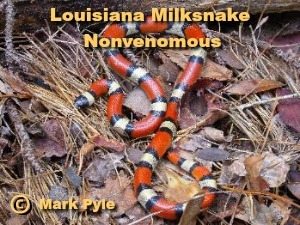 In addition to managing the above Facebook page, Mark Pyle operates this website. 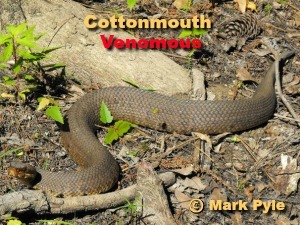 You'll find an excellent video of a cottonmouth "chasing" a human, as well as the photos used on this website and numerous other photos. Mark is renowned for his knowledge and often interviewed by media outlets. A wonderful educational resource, which we referenced above for snake bites. A wonderful resource showing photos of herps and includes maps indicating the location of specific species. A great "thank you" to Mark Pyle, a self-taught snake specialist, and the admins & members of the Facebook page "What Kind of Snake is This?" for patiently educating this author and literally thousands of people on snakes all across Texas (and beyond). Mark has also reviewed this page for accuracy. Thank you to Carl J. Franklin, Biological Curator, Amphibian & Reptile Diversity Research Center, UTA. Carl pointed me in the right direction to resources, including What Kind of Snake is This? (link above). He, too, reviewed the final article for accuracy.